Travelers looking to get from Barcelona to San Sebastian have multiple options available to them, including train, bus, car, and plane. The decision on how to make this trip will take in factors such as travel time and cost. Fortunately, there are several options for the traveler. Vueling Airlines flies from Barcelona to San Sebastian. Vueling is a Spanish low-cost airline based at El Prat (BCN) in Greater Barcelona with hubs at El Prat and Leonardo da Vinci–Fiumicino Airport (FCO) in Rome, Italy. Flying and train probably share the honors for the easiest way to get between these two cities. On the one hand, you have the shorter flight (one hour versus at least 5 and 1/2 hours on the train), on the other hand you have the simple job of jumping on a train and settling into your journey rather than having to face the hassle (and cost) of airport transfers and restrictive check-in times. And, you can enjoy the passing scenery from the train. The train from San Sebastian to Barcelona takes about 5 and 1/2 hours and costs about 40 to 50 euros. There are two or three trains per day departing from Barcelona Sants station. Buses from Barcelona to San Sebastian cost about 40 euros and takes about 8 hours, with departures throughout the day. The 550-km drive from Barcelona to San Sebastian takes about 5 and 1/2 hours, traveling mainly on the AP-7, AP-2, AP-68, and AP-15 roads. Note: AP roads are toll roads. Tip: If you're heading to San Sebastian for the tapas, you should consider stopping in Logroño on the way. The city is a favorite for tapas in Spain. Vueling flies from Barcelona (BCN) to San Sebastian (EAS). Flights cost from 70 euros (often a lot more). There are two to three flights a day with the first is very early in the morning. When you travel in that area you might find the town names confusing. San Sebastian is called Donostia in Basque. You will often see San Sebastian-Donostia and sometimes just Donostia written (especially on buses). San Sebastian de los Reyes, on the other hand, is a suburb of Madrid so don't confuse it with San Sebastian-Donostia. 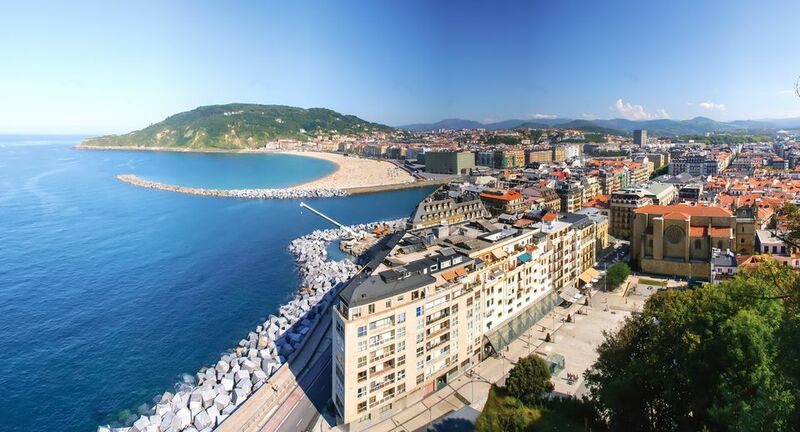 Most visitors to the Basque Country visit both San Sebastian and Bilbao. If you're deciding where to stop first, bear in mind that transport to San Sebastian is quicker and cheaper than to Bilbao. You can visit Bilbao as a day trip from San Sebastian. San Sebastian (Donostia) is known for fantastic cuisine. Basque gastronomy has gained fame for two quite different reasons: the popularity of pintxos (the Basque word for 'tapas') and its Michelin star restaurants. To walk off a few calories, you can explore San Sebastian's old town and take a stroll along Concha beach, right in the city.